Every week this season seems to have a theme. And this week - game time decisions. I picked up two players on waivers this week, Matt Bryant and Zach Miller, and both picked up injuries earlier in the week that put their games in doubt. Thankfully both shook these off, Bryant by Friday and Miller by game time. Similarly my opponent also faced the prospect of the will they/won't they decision. Cam Newton eventually missed the Monday night game through the concussion protocol while Rashad Jennings was absent for yet another week with a thumb injury, although he was warming up with the team pre-game. 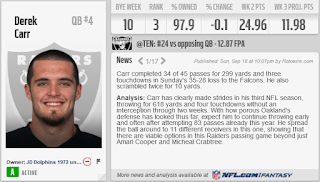 The Cam Newton injury certainly helped my team as Derek Carr vastly outperformed Kirk Cousins but the rest of the team was once again lead by the running back duo of Murray and Freeman and almost everyone had a reasonable return of points. If there is one position where I regret my decision it is the flex position. My guy underperformed and the two surprise packages sitting on my bench would have been far better choices. At least it didn't cost me this week. 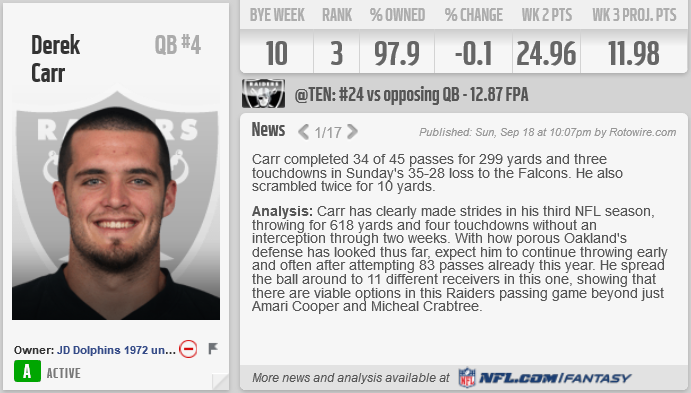 Derek Carr got off to a slow start, throwing only his second INT of the season before the game really got going. After that he settled down and a big second half performance was required after the Oakland D imploded for the third time this season. 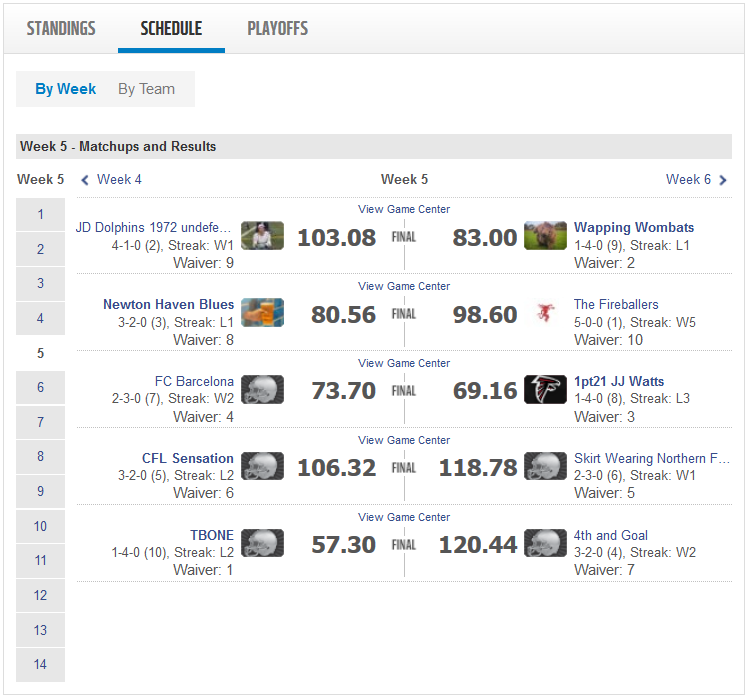 One TD for each of his WRs meant that I had a very decent return from the QB position this week. Having watched this game, I found it crazy that San Diego managed to find yet another way to lose a game this week. Tying it up with that field goal could have seen Carr boost my points further but their kick holder had butter-fingers (to say the least) and you have to wonder who the Chargers have upset so much to be this cursed. 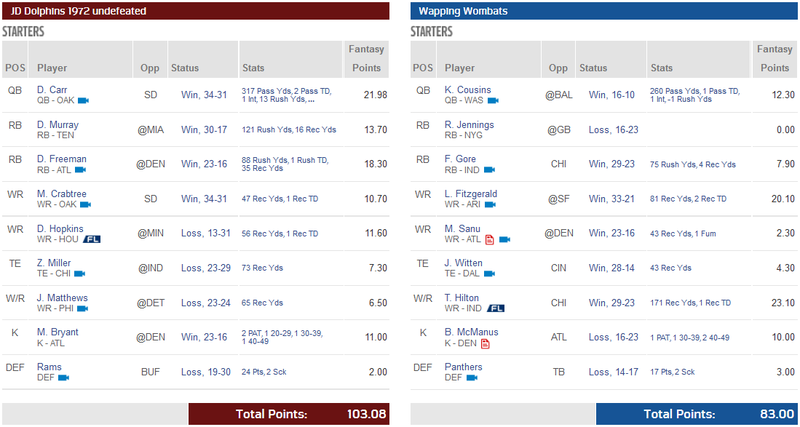 My opponent was very unlucky to have so many players on a bye week that he had to gamble on Rashad Jennings being fit. Having said that, Frank Gore really didn't come close to either of my RBs this week and the scores could have been even more lopsided if DeMarco Murray had managed to pick up a TD. 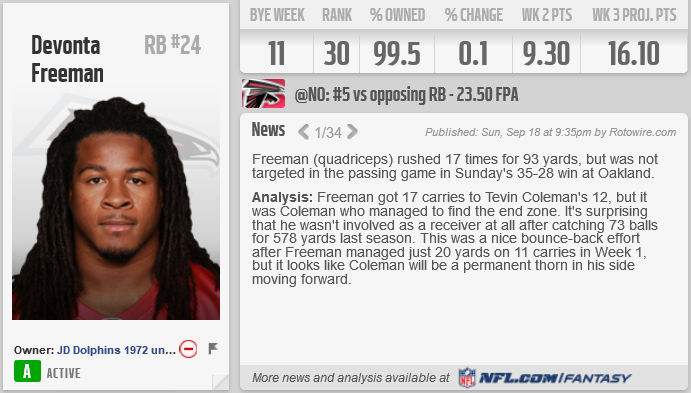 Freeman lead the way for me this week, setting the tone with a 4th down TD to start the Atlanta game, while DeMarco Murray did everything except score a TD against a porous Miami defence. It's going to be a long season for Miami fans (and we are only in week 5) with my only solace provided by this fantasy team. This could have been so much worse after Larry Fitzgerald put up 20.10 points on Thursday night. Just about everyone on the Atlanta offence put up big numbers, with the exception of Mohamed Sanu which was great news for me. 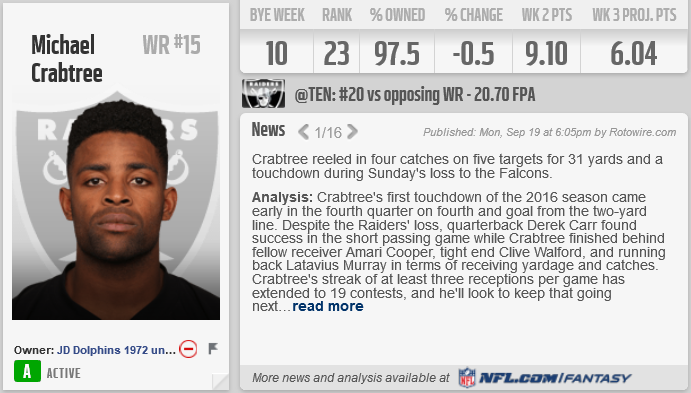 Michael Crabtree was his ever reliable self, providing me with his consistent 3 catches and 10+ points a week. Alongside him Nuk finally got something going with Osweiler, although they left it late into garbage time. Houston are struggling, this was the first game that I watched on Sunday, their O and D lines are beat up but that doesn't excuse the errant throws from Osweiler. Nuk made things happen in the 4th quarter on Sunday but if Osweiler had been better in the first three quarters they could have competed against Minnesota. The Zach Miller transaction paid dividends here. As long as Hoyer is QB in Chicago I expect Miller to be a big player in the Bears passing game. Hoyer rarely goes downfield, which hurts my WR Jeffery, and this benefits a big TE who can dominate the middle of the field. If they can get in the red zone more often Miller could start putting up some very nice numbers in the latter half of the season. Jordan Matthews under-performed and TY Hilton had a great day. There isn't much more to say about this. Matthews will look to hook up with Wentz a lot more next week as they try and overcome their first loss of the year, it wasn't even drops that hurt him this week as he had a 100% catching record. But regardless of what Matthews could have achieved this week he was never going to outdo the 170+ yards and a TD from Hilton. I tip my hat to you sir. Two kickers on opposite sides of the same game. Bryant was the dominant force all game, and only a late field goal from McManus made it look closer than it actually was. Bryant and the Atlanta offence have been so good through the start of the season that I have decided to move on from Cairo Santos. You can't argue with keeping the second best fantasy kicker in the league on your team right now when every point counts. Jeff Fisher and Case Keenum keep undermining the good work that the LA defence put in every week. Up against Buffalo LA were missing 3 of their front seven this week and yet they still held Buffalo to only 17 points with 5 minutes to go. LA set up to punt the ball away from around their own 30 and.... Fisher calls a fake, doesn't get the 5 yards and turns the ball over to Buffalo with a short field. A couple of plays later and Buffalo have a TD. With a longer field the LA defence could have held Buffalo based off of their work earlier in the game. Keenum needs to step up as QB and give this defence some help. 15 points a game won't cut it in the NFL, if you take away the big game against Tampa it looks even worse. Well there were two surprise packages this week, one perhaps more predictable than the other but still enough of a surprise that neither of them made it into the starting lineup. First up Theo Riddick, 6.5, 4.8, 5.8... No those aren't his average yards per carry, those are his total points leading up to this 20.20 outburst. Perhaps unsurprisingly for Riddick after his big first quarter he went very quiet. He still struggles to get anything going in the ground game and has to make up for it as a receiver, this will hold him back in Detroit where the change of pace from Abdullah was something that really helped Detroit to kick on in the early weeks of the season. The second surprise was Travis Benjamin. He has put up decent yardage with limited catches in San Diego over the past couple of weeks but what has really hurt his game is ball control. 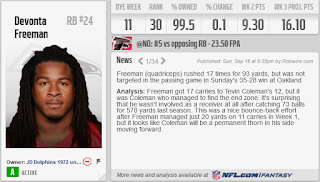 Two fumbles in as many games, with the one against New Orleans costing them the game, certainly had me questioning what role he would have in the offence this week. He answered his critics with a 100+ yard game and no fumbles. If he can add in some TDs he could be a very useful piece down the stretch. Honourable mentions to Dennis Pitta and Alshon Jeffery with their respective 59 and 77 receiving yards. Both would like to start adding TDs to their game sooner rather than later and they should get the chance over the next few weeks. Some of the more astute members of the audience may have noticed Jameis Winston sneaking in at the bottom of my bench there. He was a late addition to my team on Monday night after I saw his name appear in the activity column for my league. Rather than carry two kickers I have decided to go with two QBs, especially as he Winston will be getting Doug Martin back after their week 6 bye. Going into week 10 the Bucs face the 49ers, the Raiders, the Falcons and the Bears all of whom like to give up points to QBs. Atlanta will pose the sternest test but Winston will probably only see the field in week 10 when Derek Carr and the Raiders go on their bye week. Chris and The Fireballers remain undefeated after 5 weeks, with the Dolphins holding second place. 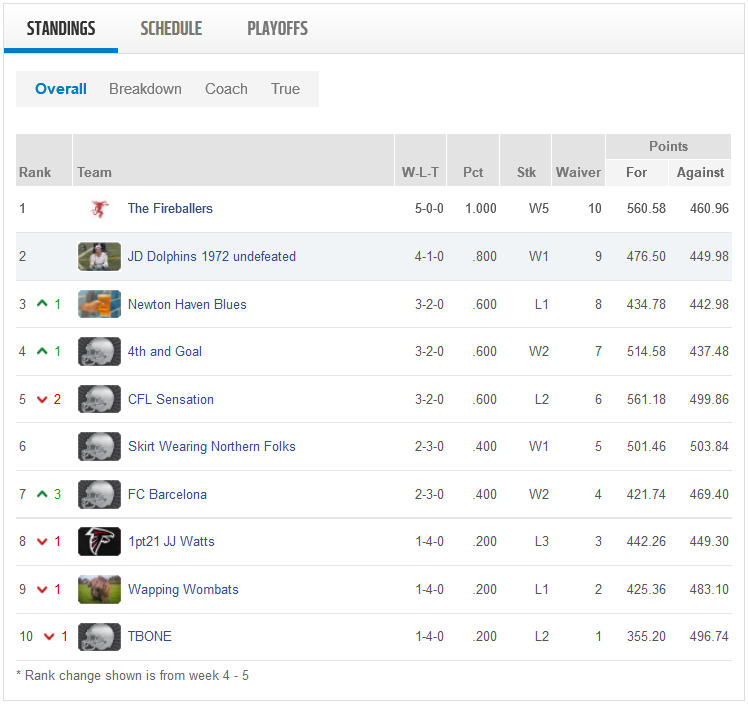 Newton Haven Blues jump up one spot despite their loss as CFL sensation drop out of the playoff picture for the first time this season with a 2 game losing streak. 4th and Goal have bounced back from their slow start to pick up two wins on the trot to grab the last playoff spot and the final winning record this week. Skirt Wearing Northern Folks and FC Barcelona both sit at 2-3 having won this week. FC Barcelona are building on their success last week against the Dolphins and hoping for a surge into the playoff spots. At the bottom three teams share a record of 1-4. 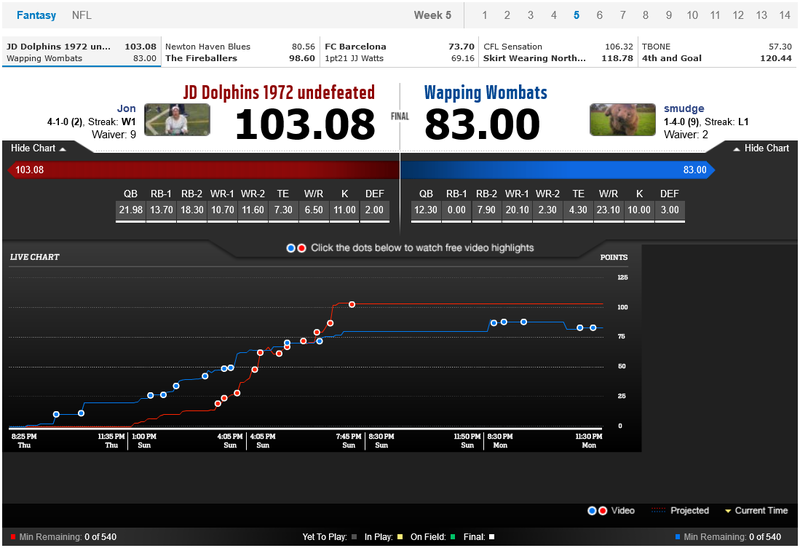 1pt21 JJ Watts are on a league leading 3 game losing streak while Wapping Wombats will look to regroup and go again for their second win. Propping up everyone this week is TBONE on a 2 game losing streak. The Dolphins face 4th and goal in the upcoming games this week while the undefeated Fireballers face the early season leaders CFL Sensation. Newton Haven Blues look to bounce back against FC Barcelona who are pushing to enter the playoff picture. Skirt Wearing Northern Folk have the easiest match-up of the week against a struggling TBONE and JJ Watts vs Wapping Wombats rounds out the fixtures for week 6.